Varietals of wine grapes are endless: Chardonnay, sauvignon blanc, pinot noir, merlot, cabernet sauvignon, riesling, malbec, barbera, Nebbiolo, sangiovese, pinot grigio … and more! There are hundreds upon hundreds of wine grapes grown throughout the world. Most of those we’re familiar with come French or Italian grapes but have you ever heard of alvarinho, verdelho, malvasia, alicante, tinta roriz or touriga nacional? If not, we wanted to introduce you to some Portuguese wines making their way to more and more on wine lists at some of your favorite restaurants and wine bars. Portugal is located in the Iberian Peninsula in the southwest of Europe, bordered by Spain on one side and water on the other. It’s a small country, only 35,645 square miles (575 miles long by 138 miles wide), which makes it the same size as the states of Maine or Montana. That said, while Portugal may not be a big country, it has the ninth largest vineyard area in the world in comparison to the United States, which ranks sixth. Portugal is the ninth largest exporter to the United States, behind France, Italy, Spain, Chile, Australia, New Zealand, Argentina and Germany. Twenty-five percent of what is exported are delicious fortified wines, Madeira and Port and seventy-five percent of the wine exported to the US from Portugal are still, dry wines. This story originally appeared in the Napa Valley Register. Some regions in the world are known for single varietal wines, such as pinot noir and chardonnay in Burgundy, nebbiolo in Barolo and tempranillo in Ribera del Duero. In other regions, such as in Bordeaux, Riojo and the Southern Rhone, they are known for their blends. I am not here to say that one is better than the other. A single varietal wine can truly express the terroir it comes from. On the other hand, a well-crafted blend will balance the different characteristics of each grape to enhance aromas, color, texture, body or finish of a wine. The Rhône Valley in France is one of the regions known for its blends. In the Southern Rhône, grenache is the dominant variety but traditionally it is blended with syrah, cinsault and mouvedre. Blending is one of the required rules in Côtes du Rhône and other appellations in Southern Rhone. Therefore, I was all the more surprised when tasting wines at Découvertes en Vallée du Rhône, the Rhône Valley wine fair earlier this year, where I found more and more producers offering 100 percent grenache wines. When asked what I love to do, I explain that I love to travel and explore different cultures. I especially liked to learn about cultures through their food and wine and a perfect outing for me is a delicious meal and good company. So a movie about traveling through the country while eating is very appealing to me. 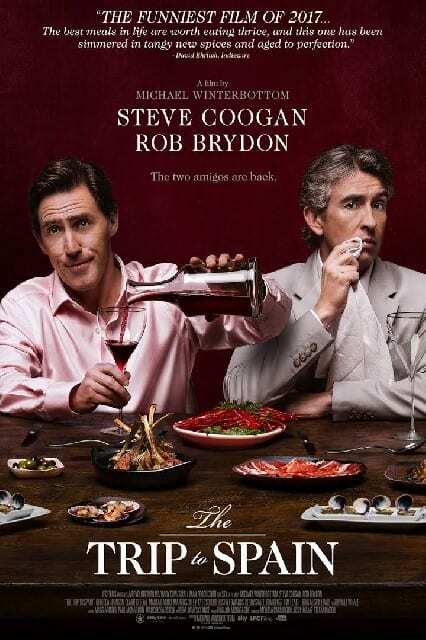 And the newly released The Trip to Spain, the third in a series of culinary road comedies featuring Steve Coogan and Rob Brydon, is just that. Gorgeous scenery, delicious-looking food and witty banter make the movie The Trip to Spain the Please The Plate pick of the week.